The way I blog has changed a lot. Part of me really misses how things used to be when I first started writing here, seven years ago. I no longer have the luxury of that unedited, impulsive, stream of consciousness sort of blogging. Things are different now, my days are much more full, I can't (and shouldn't) disclose every little feeling and perception and experience I have. I used to be able to sit down and write at almost any given moment. The thoughts would come, I'd write them down. I struggled with figuring out how to make time for blogging after I became a mom—back when my days were kind of a mess, and I was kind of a mess, and I didn't know how to put much of it into words that didn't involve complaints about lack of sleep and/or some mention of how I desperately needed another cup of coffee. But as the months (and now, years) wore on, my life gained some semblance of a routine, and I started to really miss blogging. I missed having a place to share my thoughts, photos, discoveries, and other general musings. Although my writing has changed a lot since day one (which is a good thing, given how many years have gone by), I'm glad that my blog still fits. I'm glad I'm still here. Of course, it didn't take long to realize that writing at the exact moment I wanted to write just wasn't going to happen. At least, not very often. And once I got past that (and convinced myself it didn't make me any less genuine), things got much easier. So, for now, this is where I jot down my post ideas from day to day. 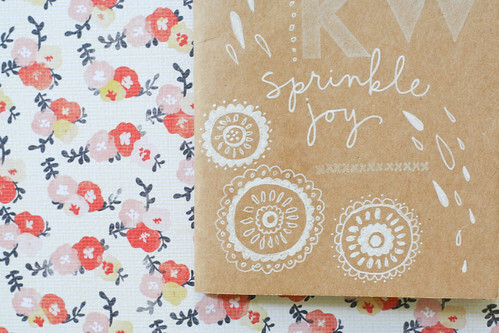 My happy little blogging notebook. When I do have time to sit down and write (and schedule posts, which I used to view as forced and awkward, but is now the only way I can manage to complete more than one post per week), it's nice to have something to reference…something to spark my inspiration. I can have an a-ha moment: Oh, yeah! That. I wanted to write about that. I'd totally forgotten. Okay, let's do this. Naptime only lasts so long. It's kind of refreshing, and I feel less overwhelmed and lost when I sit down to write. I received this notebook from a friend, and was clearly in the mood to attack it with a white gel pen, a few stamps, and some washi tape. I don't always like how my carefree doodling turns out (as opposed to, say, strategic doodling?) but somehow I ended up being completely happy with this notebook. It feels very…me. Since deciding to fill it with blog post ideas and inspiration and such, it's become something I always look forward to picking up. And it is rather helpful. Sometimes I wonder where my blog will be, five years down the road. Change is inevitable, and there will probably be a time that I may not have time to do much of anything around here again, and I'll just have to roll with the punches. For now, at least, I feel like I've figured out some sort of method to the madness of actively blogging while mothering a toddler. Which certainly isn't always the easiest task…but is something that is worth the extra effort, for sure. 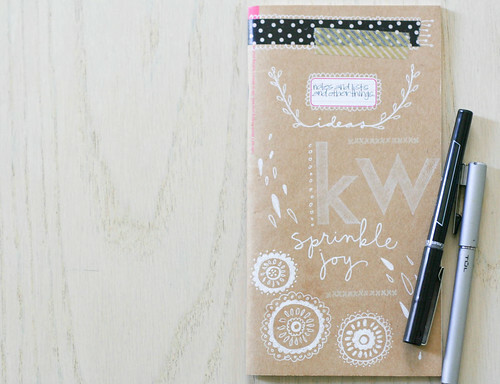 Where do you get your washi tape? I never seem to see it anywhere. 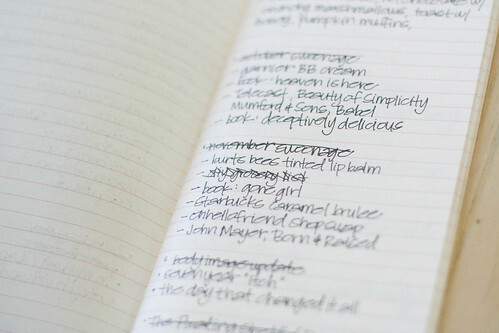 I love your notebook, and the look of your blog too. They both are spaces of light and joy to me. I am so glad you are still blogging in a way that works well for you. I haven't been at it that long (about two years), but I'm always scribbling things down here and there and hoping to get to them. Cheers to whatever works! I love this. That 'stream of consciousness' sort of blogging you described is exactly what I'm shying away from as well. I want to write with purpose and oomph. I don't want to be deep and sappy ALL the time, but just more... I don't know, intentional? Anyway, I love you and your writing and your doodles and your face! 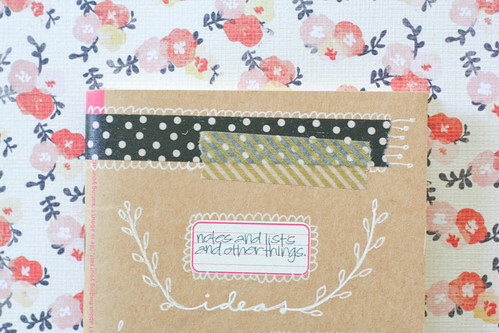 Such a cute blogging notebook! At first, I loathed the idea of blogging on a 'schedule,' but much like you and many others - scheduling posts and jotting down ideas is about the only way I manage to blog with any sort of consistency! Thanks for sharing, I feel like I can relate! Very cute notebook! I usually just create a quick draft post using the Wordpress app on my phone, with just a few words to remember what I wanted to write about. I do think it's interesting to look back and see how my life (and blogging) has changed over the years... so many things I used to post are now just twitter or facebook updates. Your photos are always swoon worthy, so pretty! I was very adverse to scheduling blog posts because I felt it ruined the spontaneity and stream of consciousness aspect of blogging -- but now I use it all the time. I guess that's what happens when you grow up, get a job, and aren't a college undergrad anymore. I love this. :) And your doodling is amazing, lady.